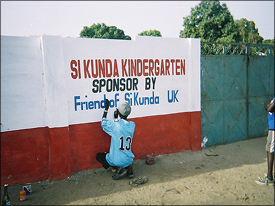 In 2003 we raised enough money to build a wall around the kindergarten in Si-Kunda village, this increases the children’s safety within the school grounds, and help keeps the snakes out! The wall is 80 metres by 60 metres, and 2 metres high. 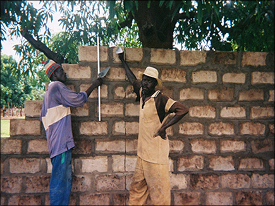 All building work was carried out by local villagers, and each brick made by hand. The cement was delivered by donkey cart from the nearest town, and the stone and sand came from the coast. The last lorry load became stuck in the mud on the way as the rainy season had just started by then. The project was completed in just 2 months, with the gates being hung in the August. Cultivation was started in an area of the school grounds with fruit trees and vegetables being planted. This will help to provide a midday meal for the children, and at the same time teach them how to grow produce and about the food they are growing. For example, we are promoting the moringa tree, which has great nutritional value in its’ leaves. Any surplus plants and produce will be sold to help with the funding of the school. Until October 2003, the kindergarten, which has up to 150 children, had no provisions other than tables, chairs, and a blackboard in each of the two classrooms. We have now provided enough blackboards and chalk so that each child can have his / her own, with plenty in store for later use. They now also have some sports and play equipment, and various other items to help the teachers with their work. 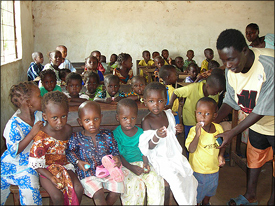 We are providing sponsorship for each of the kindergarten school teachers, and caretakers. Until September of 2003 they had been working voluntarily.